Alfa Laval SX UltraPure, Alfa Laval’in Farmasötik ve Biyoteknoloji endüstrilerindeki yüksek saflıktaki uygulamalarda proses sıvılarının yumuşak taşınması için özel olarak tasarlanmış döner lob pompasıdır. Introducing the SX UltraPure, designed specifically for transporting sensitive liquids efficiently and effectively. With the Alfa Laval SX UltraPures multi-lobe rotor geometry it offers low pulsation and gentle pumping. This makes it the best choice for transferring sensitive products such as blood, plasmas and live cultures that require gentle handling to minimize shearing and prevent product damage. This EHEDG-approved pump is designed for both Cleaning in Place and Sterilization in Place. Low pulsation, low shear and low noise characteristics, while ensuring efficient fluid transfer, are trademarks for the Alfa Laval SX UltraPure pump providing process repeatability and increasing product quality and yield. This high level of performance has been achieved through a detailed understanding of flows and the exact geometry of the rotors and rotor case. For this Alfa Laval employs Computational Fluid Dynamics (CFD). Alfa Laval SX UltraPure rotary lobe pumps are designed with features that maximize performance and minimize the risk of contamination. These include a low-profile rotor nut, hygienic front-loading mechanical seals, defined compression front cover sealing, USP Class VI elastomers, fully drainable pump head with 3° fall angle, enhanced surface finishes and paint free stainless steel gearbox. In addition the wetted components have full 3.1 traceability and manufacturing transparency with Q-Doc documentation package based on GDP (Good Documentation Practice) ensuring consumer safety. Designed for maximum cleanability and ease of access, the Alfa Laval SX UltraPure pump is a robust, reliable, low maintenance solution. Alfa Laval manufactures all pump parts, including the rotor case and high-precision rotors. This facilitates maintenance and guarantees full interchangeability of spare rotor parts. For reliable operation and lower maintenance the robust stainless steel gearbox construction comes with heavy-duty shafts, torque locking assemblies and taper roller bearings throughout. The gearbox’s universal design provides the flexibility of mounting the pumps with inlet and outlet ports in vertical or horizontal position. Available in 14 different models, Alfa Laval SX UltraPure rotary lobe pumps are capable of handling of a wide variety of viscosity and temperature requirements, flow rates up to 115 m3/h, pressures up to 15 bar and temperatures up to 150°C. A wide range of seals are available to ensure that the right seal is selected for the specific application. Standardised for easy specification, available globally and supported locally, ensuring repeatability of process and increased uptime. All Alfa Laval SX UltraPure rotary lobe pumps are supplied with the Q-Doc documentation package to assist in qualification, validation and change control. They comply with EHEDG, 3.1 and FDA hygienic standards and have ATEX approval for use in explosive environments. For more information, please consult the documentation provided. Alfa Laval UltraPure pompanız için dokümantasyona mı ihtiyacınız var? Tüm Alfa Laval UltraPure pompaları, çelik, contalar, vb. gibi tüm ürün temas parçalarının tam izlenebilirliğini sağlayan dokümantasyon paketimiz olan Alfa Laval Q-doc ile birlikte tedarik edilmektedir. 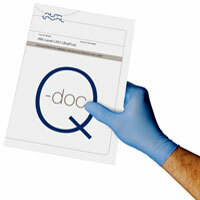 Alfa Laval Q-doc her zaman mükemmel bir uyum sağlar ve olası muhtemel sorunları önler, yeniden onaylama gerektirmektedir. Alfa Laval rotary lobe pumps are conventional positive displacement pumps with rotor case, rotor case cover, rotors, rotor nuts, shafts, gearbox, shaft seals and elastomers. The pumps operate with no internal contacting parts in the pump head. The SX UltraPure can be supplied either as a bare shaft pump or mounted on a base plate complete with coupling, guard, gear motor and shroud for easy plug-and-play installation. The standard materials of construction are 316L stainless steel for all wetted parts and a paint free steel gearbox. Other materials are available on request. In addition, Alfa Laval manufactures all pump parts, including the rotor case and high-precision rotors. This facilitates maintenance and guarantees full interchangeability of spare rotor parts. A gear train in the pump gearbox drives the rotors and provides accurate synchronization, or timing, of the rotors. The contra-rotating propulsion system has two rotors spinning in opposite directions within the pump head. Fluid is carried through the pump in the cavities formed between the dwell of the rotor and the interior of the rotor case.